With summer officially here, people are enjoying the great outdoors while they can. Friends are going on road trips, families are going to different destinations on the weekends and even pets are enjoying the sunny weather. This time of year is perfect for camping trips, but the old activity is being shadowed by new developments. We first saw “new camping equipment” in movies. Most films that revolved around camping had two characters: one with an old-fashioned tent, the other with a shiny, gigantic RV. One character liked the idea of camping without cool gadgets and equipment. They packed food in containers, slept in sleeping bags and if they felt dirty, they went for a swim in a nearby lake. The other character revolved around modern technology. They barbecued their food, slept in the RV and preferred their vehicle’s “shower” instead of the lake. Some may point out that people that do these things don’t like the rugged outdoors, but it doesn’t come down to a matter of preference. 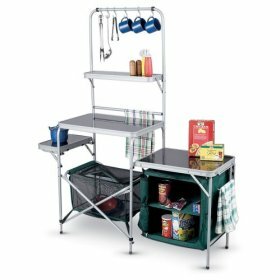 More and more inventions are that take away the essence of camping are being created. Some items are okay, because they don’t take away the aspect of being outdoors entirely. Others, like the following, do. It may be because they’re either similar to what we have at our homes or just plain unnecessary. When you go camping, you’re supposed to get away from modern civilization. That includes home-cooked meals and your local pizza delivery boy. Packing food ahead of time gives families more time to enjoy the great outdoors because they’re not tied down with cooking. Cooking outdoors is a great idea, but when you start getting pots and sets, like the GSI Outdoors Dualist camping cookware , it’s a bit too much. Plus, when you’re actually cooking in the outdoors and not just roasting hotdogs over a fire, there’s a greater chance you’ll attract unwanted wildlife to your campsite. 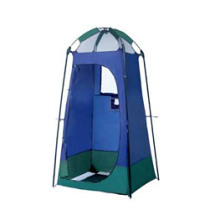 The main point that should be made about camp showers like the Stinky Pete Shower Toilet Tent is they’re a bit too much. Choosing to shower in a tent-like structure instead of swimming in a cool brisk lake is an unnecessary choice. Sure a portable camp shower like this one has a self-draining floor, but what’s stopping an individual from cannon-balling into a lake? Not only do you get to have more fun, but you get to save yourself some money at the same time. While camping, there are tons of activities a family can do. 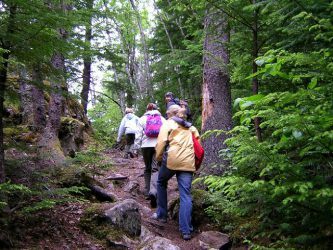 If fishing isn’t exciting for everyone, there’s the option of going hiking in the woods and doing some exploring. But if you’re tired when you come back from your trip, where are you supposed to rest? 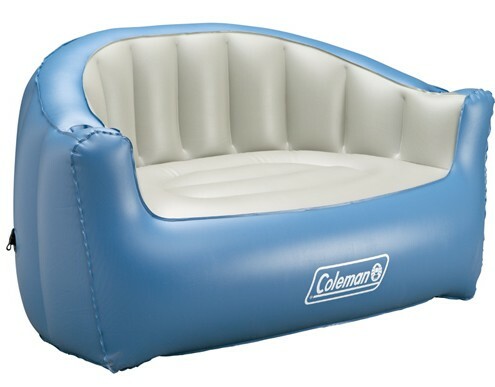 Coleman has the answer with their Inflatable Adult Loveseat . Probably one of the most unusual piece of camping equipment I’ve ever laid my eyes on, the Coleman Tent Nightstand (aka. Checkerboard). The manufacturers claim it’s the perfect companion to your inflatable mattress, folding chair and portable table. It’s also a great nightstand that can be used as a checkerboard. I know pointing out the negative aspects of some camping equipment isn’t a great thing to do, but inventions like these are hurting the true aspect of camping. When you go away on a camping trip, you’re suppose to get away from everything you’re used to, or else it doesn’t seem like an adventure. Going out for swim in a lake and cooking hotdogs over an open fire is definitely more of an adventure than huddling in a camp shower and washing dishes outside your tent. New G.I. Joe Verses Old G.I. Joe... Which Is More Cool? Don't like them? Then don't use them. 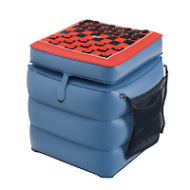 Products like these are good for making camping more accessible to people with disabilities; not everyone can jump in a lake, and not everyone is comfortable sitting on a log or rock, especially if they have back or mobility problems. Not every camping spot has a convenient lake, river, or even stream. Cooking over an open fire isn't always an option, depending on things like fire danger and weather, and is not much fun in 90+ degrees. Then you have to thoroughly put it out or leave someone behind every time you want to leave camp. And eating hot dogs constantly for a two or three week camping trip just doesn't appeal to many. 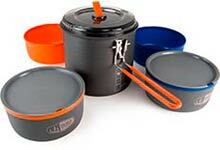 Most backpackers even carry a small stove and cooking set. While I don't think of using an RV as camping, that doesn't invalidate it for those who do, or as mentioned in the previous post, for those with disabilities who can only camp with the help of equipment. How about having someone review products who actually sees a use for them? Also: the title should use "its" instead of "it's." No apostrophe. Thanks, the typo has been corrected.